(Marlborough Gallery, Inc., New York); sold 1976 to Robert and Jane Meyerhoff, Phoenix, Maryland; gift 1989 to NGA. Provenance from The Robert and Jane Meyerhoff Collection 1945 to 1995, Exh. cat., National Gallery of Art, Washington, D.C., 1996: 260. Paintings by Clyfford Still, Albright-Knox Art Gallery, Buffalo, 1959, no. 58. 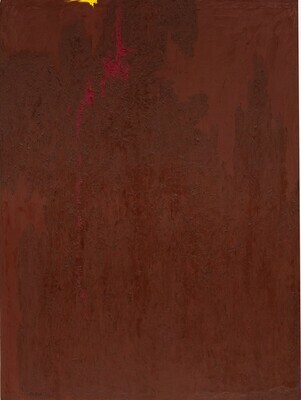 Clyfford Still, Marlborough-Gerson Gallery, Inc., New York, 1969-1970, no. 26, color repro. Art for the Nation: Gifts in Honor of the 50th Anniversary of the National Gallery of Art, National Gallery of Art, Washington, D.C., 1991, 394-395, color repro. The Robert and Jane Meyerhoff Collection: 1945 to 1995, National Gallery of Art, Washington, D.C., 1996, no. 183, color repro. Founders and Heirs of the New York School, Museum of Contemporary Art, Tokyo; The Miyagi Museum of Art, Sendai; The Museum of Modern Art, Ibaraki, 1997, no. 20, repro. Monet and Modernism, Kunsthalle der Hypo-Kulturstiftung, Munich, 2001-2002, unnumbered catalogue, repro. The Robert and Jane Meyerhoff Collection: Selected Works, National Gallery of Art, Washington, D.C., 2009-2010, pl. 6. The Robert and Jane Meyerhoff Collection: 1945 to 1995. Exh. cat. National Gallery of Art, Washington, 1996: no. 183.